If you love Halloween but get bored handing out candy to trick-or-treaters yourself, you may have considered getting a candy dispenser to do the work for you. Other people have too—and then made their own. These range from cute candy dishes children can help create to gloriously geeky Rube Goldberg–esque design projects. Here are a few of those homemade Halloween candy dispensers, ranked from the simplest to the most complicated. The simplest candy dispenser is a bowl set out for kids to grab candy from. But you can make something that’s a little more seasonal, and make it a family craft project. Arena Blake at The Nerd’s Wife shows us how to decorate a milk jug to turn it into a goofy monster from which kids can help themselves to candy. Note that the “mouth” opening makes it a little harder to grab more than your fair share—unlike an open bowl. Lindsay Eidahl made this Frankenstein candy dispenser for a family Halloween party. She covered a cereal box in black and green construction paper to form a stylized Frankenstein’s monster. As with the jug monster in #1, you have to reach into his mouth to get your candy. Find the instructions at My Creative Days. Areian Krieger from One Krieger Chick shows us how to make candy dispensers that hold enough candy for one child. The body and head are made from a postal mailing tube topped with a ball and decorated with paper, glue, ribbons, sequins—whatever craft bits you have on hand. It’s a perfect activity for a children’s Halloween party—and each one can be sent home as a party favor with small supply of candy inside. Get the instructions at So You Think You’re Crafty. Crafted from colored tape, contact sheets, and a box, this pumpkin candy dispenser doesn’t look at all homemade. Choose a box size that matches how much candy you want to dispense, then follow the instructions. The easiest dispenser to use is tech that someone else has already developed. Deric Peace used his refrigerator’s automatic ice dispenser. Just turn off your ice maker, fill your ice bin with small chocolates, and you can get nice chilled chocolate any time you want. This will impress party guests and trick-or-treaters (if you are willing to let them into your kitchen). When he was a child, Scott Miller's neighbor had a machine that automatically dispensed candy in response to a child entering Morse code … or so he thought. Eventually he found out his neighbor was actually operating the "machine" from behind a curtain, manually dispensing the candy. Years later, Miller decided to make the automatic candy machine of his childhood imagination come true. 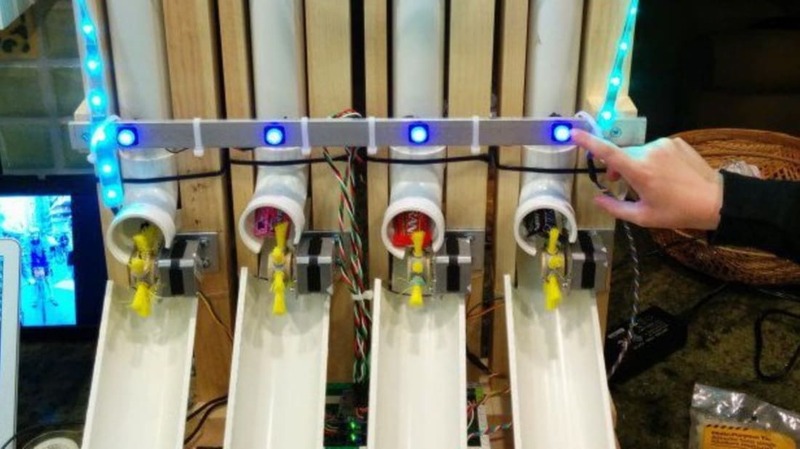 Composed of PVC pipe, the dispenser is laid out like a pipe organ, with four kinds of candy to select from. The dispensing is controlled by an Arduino Leonardo microcontroller and custom software. You can see the build process here. Ben Rady wanted a candy dispenser that prevented someone from taking all the candy at once—and was also fun to use. So he made one that incorporates a game. When a child pushes a button, the display goes to work with sound effects imitating a spinning wheel of fortune game where you could land on either "candy" or "death." It always lands on candy, but the thrill comes from not knowing that. It’s a rather complicated setup, as you can see from the instructions and the accompanying video that shows the workings from the inside. Tech whiz Noel Portugal shared his automatic candy dispenser in 2010, and it went viral. This is state-of-the-art, as far as trick-or-treat goes. When trick-or-treaters show up at my house they can text, call, or tweet a code displayed on an LCD screen to get their Halloween candy. They can also push the Big Red button. Once the candy request is made a few "special" effects are triggered by X10 modules. A low laying fog machine is activated and lights turn on while the candy shoots down from my front deck on the second floor. If you are up to the task, he’ll show you how to make your own at Instructables. Better check the materials list before you decide to jump in. In this Raspberry Pi project, Charles Gantt gives us a candy dispenser that plays a trivia game. When a child steps in front of the machine, a touch-screen LCD display presents a trivia question and four possible answers. If the trick-or-treater selects the correct answer, they get three pieces of candy. If they answer wrong, they get one piece of candy. All responses provoke flashing lights and sound effects. The build process is several pages long. Gantt ended up building a tombstone with a skull to hold the dispenser.